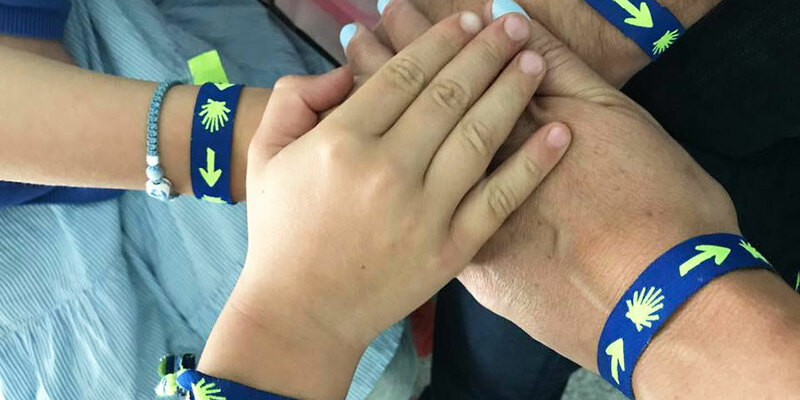 The most important factor to keep in mind when planning your Camino with children is considering their age and ability. Toddlers they will need to be carried at some stage (there are many hiking backpacks out there that will be really useful) or pushed if you choose to travel with a trail-friendly buggy. Children over 6 years of age will enjoy the walk, as long as distances are planned carefully. If you are travelling with teenagers, they will definitely enjoy the challenge and all they will need is a bit of training, just like adults. Are the children used to walking? Do you take them for hikes regularly? How long can they manage before they get bored, need a break or need to be carried? You know your children best! The standard walking itinerary for adults covers around 20 to 25kms per day so it will be too long for little legs. We would suggest going for the ‘Easy Walking’ itineraries, that cover an average of 10-15kms per day, if you are travelling with younger children. 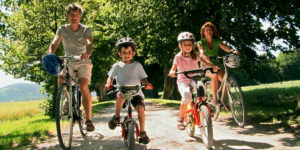 If your little pilgrims are not used to big hikes but they love cruising around by bike, we would suggest cycling the route. Whether is on their own steam or sitting comfortable at the back while you do all the pedalling will depend on their age. 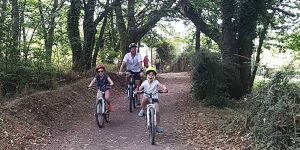 Our director Roland cycled the Camino from Sarria with a group of friends and 5 kids of ages ranging from 2 to 8 years of age and they all had a superb time. They cycled 25kms per day, which is really manageable as it can be covered in roughly half a day. “I had asked for selected accommodation to offer either swimming pool or garden space for the kids. Each day we had lunch en-route, and finished at approximately 2pm. That was perfect and one of the best holiday we ever took,” he explains. Which Camino should we take? The Camino Frances is the most popular route and as such the one where you will find most services, such as cafes and places to rest. For that reason it will be the most suitable for children. 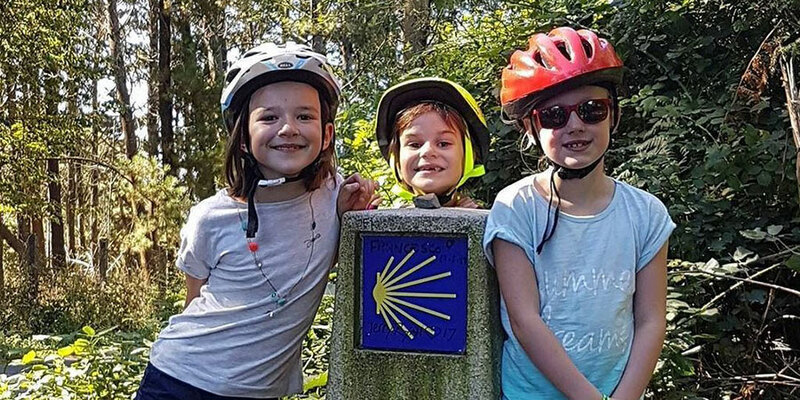 It is also the most social of all trails as 65% of all pilgrims take this route so they are likely to meet other children and make Camino friends along the way. We also have an Easy Walking itinerary for the last section of the Camino Portugues from Tui (the second most popular route) and the Portuguese Coastal Camino from Baiona or Vigo. If you are travelling in the Summer months, we would recommend the coastal route so you can enjoy the beaches between Baiona and Vigo. If you can, try to avoid the hottest and the wettest months. May, June, September are probably the best to get mild temperatures and minimal rain. Cycling the last 100kms of the Camino Frances from Sarria over 1 week, including 5 cycling days covering from 22 to 28kms per day). Route details: Classic Camino. Easy Walking from Sarria. 10 nights, including 9 walking days. 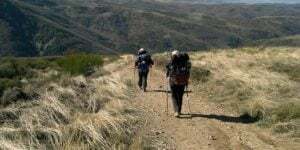 You will be walking the last 100kms of the Camino Frances, covering 10-15kms per day on average. You can start closer to Santiago if you rather walk a shorter distance. Route details: Classic Camino Easy Walking. Easy Camino Portuges from Tui. Route details: Easy Camino Portugues. 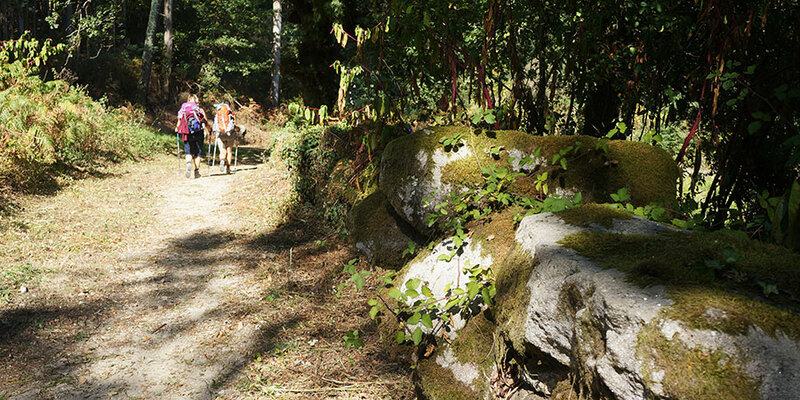 Easy Coastal Camino from Baiona. Route details: Portuguese Coastal Easy Camino. 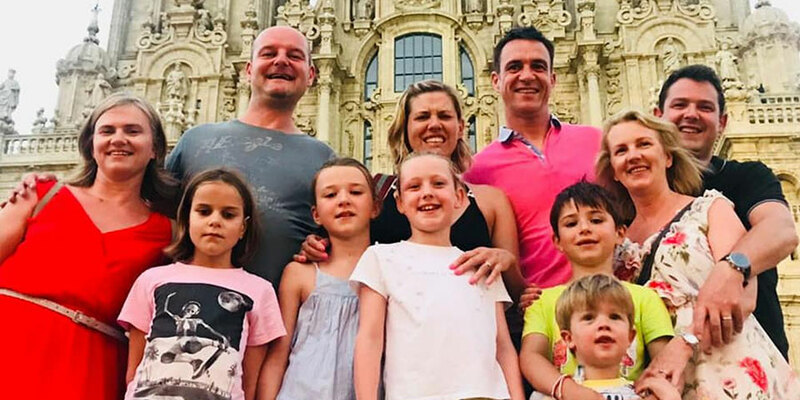 At CaminoWays.com we have special discounts for young pilgrims: children up to 2 years of age travel free and children from 3 to 12 get 20% OFF. Thank you so much for getting in touch Anita and apologies for the delay. 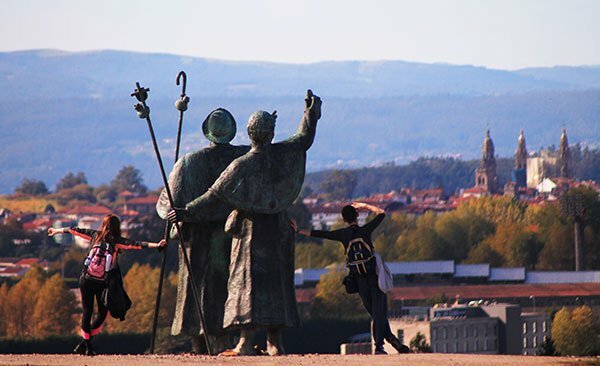 If you are looking to walk for a week and finish in Santiago the most convenient airport will be Santiago de Compostela, Aerlingus has direct flights from Dublin. Our team will email you some details regarding price and routes. Kind regards.